Get access to the Puma online outlet and shop amazing must-have items up to 60% off! Casual and sporty: Welcome to the Puma Online Outlet! During Otrium’s Puma sale you can buy clothes and shoes with high discounts! Sports brands are conquering the fashion world and we can only be grateful for that. In this Puma outlet you will discover how you can easily combine sporty items with a casual outfit. But this online outlet is also the place to be for those who like sports. We like to welcome you all! Puma would never have existed if the Dassler brothers had not fallen out. This may seem a sad start for a successful brand like Puma, but that is the reality. Let’s go back to the German town of Herzogenaurach just after the First World War. It was the brother Adolf who started making shoes in the laundry room of the family home. The small enterprise was successful and in 1924 the older brother Rudolf decided to take it to a higher level. The Gebrüder Dassler Schuhfabrik was born! The factory was a hit with a great highlight in 1936 when the athlete Jesse Owens wore Dassler’s shoes during the Olympic Games. And while wearing these shoes he won no less than four golden medals. But the joy was short-lived because after the Second World War the brothers fell out and went separate ways. The family feud led to the creation of not one global brand but two global brands. At the end of the 40s Adolf was crowned the founder of Adidas and Rudolf could call himself the creator of Puma. All’s well that ends well (at least for the fashion / sports world). Nowadays Puma has become one of the most famous sports brands in the world. But the brand increasingly manages to conquer the regular fashion market. For example the iconic sneakers that you can also buy in this Puma outlet. Puma has also become an indispensable player for the sports world. Puma sponsors numerous national teams and world-renowned athletes. And soon it will also sponsor your style! 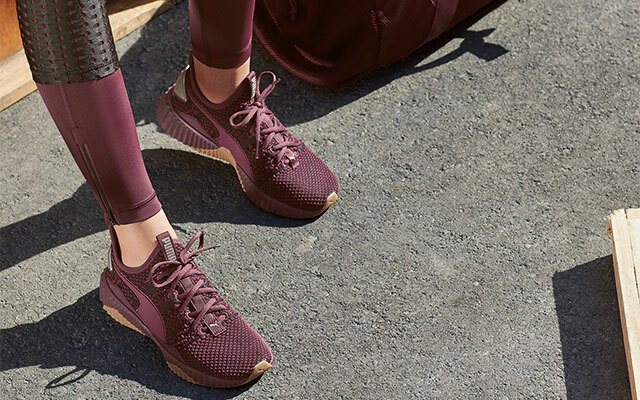 Puma’s main activity is designing progressive clothing and shoes for athletes, football players, tennis players and other sports fanatics. In addition Puma also focuses on non-athletes who like to finish their casual outfit with a sporty look. Puma sneakers for example are extremely comfortable to walk in. A sports brand knows best how it can make you walk on clouds so you feel like you can take on the whole world. Puma is a quality brand that rightly demands high prices for its clothing and sneakers. But at Otrium we like to make Puma accessible to everyone. That is why we compete every day for the highest Puma discounts so you can buy that specific pair of sneakers. At home you can decide which items and which sizes you want to place in your shopping cart. If you order today, your parcel will be delivered tomorrow. That is almost as fast as a puma! In this online outlet you will be spoiled with the nicest clothes and the most beautiful shoes. For example sporty pants, shirts, sweaters, cardigans, hoodies, T-shirts and jackets. Do you want to buy Puma sneakers, sandals or trainers? This Puma sale is definitely the place to be. We frequently add new items to this outlet. Therefore we advise you to register so we can always notify you when new items become available. Do it today and follow the example of tens of thousands of other Puma followers. From XXS to XXL: we at Otrium try to offer a wide range of Puma sizes. This also applies for the shoes, we offer both the smallest and the largest sizes. So plenty of choice for everyone in this outlet. Use the filters to speed things up: Tick your size and find out which items are still available for you. Trust us: this is really faster than a puma! Discover the wide range now! This sale is well stocked with the most sporty and casual clothing and shoes from Puma. It is up to you to buy these now at the best prices!